Iron Acton is a small rural parish to the north of Bristol, within the county of South Gloucestershire. Nestled between Frampton Cotterell and Yate, the parish includes the small farming area of Latteridge to the north west, the areas of North Road, Mission Road, Tanhouse Lane, Broad Lane, Yate Road, Stover Road and Engine Common to the east, with Iron Acton village to the south. Mining took place in the Engine Common area and consisted of eight mines which were at their peak from about 1830 to 1890. Mention is made of a small settlement in this area as far back as the Doomsday Book. 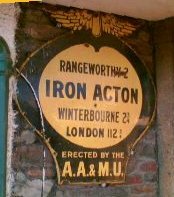 The generally agreed meaning of the name Iron Acton suggest that 'iron' originates from the mining of iron that used to take place near the village, whilst 'acton' means "many oak trees". Still today there is an oak woodland within the parish situated alongside the River Frome and is locally referred to a Chilwood. The parish is an interesting combination of very old properties, through the years to more modern-day dwellings, a sprinkling of bungalows as well as affordable housing. The older part of the village was designated a Conservation Area on 30 July 1975 and is unique in that none of the houses are numbered, causing only a minor problem to an unfamiliar postman ! The village is also very proud of its Village Green with essential May Pole, where May Day is celebrated each year with a village fair, involving the whole parish, and traditional dancing. However the parish of Iron Acton can boast not one, but two village greens, the second village green being located in Latteridge. Shortly after the Norman conquest, the family of Acton held the manor of Iron Acton. It descended through several generations to Sir John Acton who died in 1344. His estates passed to his cousin Maud and it is here where the Poyntz connection begins. Maud was the second wife of Sir Nicholas Poyntz who had died in 1312. He had been dead for many years and Maud was an elderly woman when the estates passed into the family. The Iron Acton estates the passed to her son Sir John Poyntz and from 1344 continued son succeeding father until the death of Sir John Poyntz in 1680. He was the last of the family to be Lord of the Manor and after his death the manor was split up and Acton Court was sold to William Playes esq. Acton Court is an impressive and striking building which, although it has suffered from years of neglect. is now being restored to its former glory by English Heritage. It is a large, mainly Tudor building, formerly the Medieval manor house of the Poyntz family. Its main features include large brick diagonal chimneys and moulded stone doorways. The gateway to Acton Court is late 16th Century and forms a notable entrance way to the Court. It is highly decorative with shields and foliage adorning the spandrels. The Poyntz family was related to the Tudors and it is said that Henry VII, Queen Elizabeth I and Sir Walter Raleigh were all entertained at Acton Court. Another interesting feature is the elaborate early 15th Century churchyard cross, considered by some to be a preaching cross and by others a memorial cross to one of the Poyntz family. The original height was some 30 feet and the builder was the first Sir Robert Poyntz who died in 1439.